If you follow me on Facebook or Twitter, you might have seen that we've had a busy week. And if you read this, you'll be relieved to see I'm still here, not shot, but slightly emotionally battered and bruised! 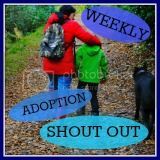 We started with a review of our Post Adoption Support, although our Post Adoption Social Worker was unavailable. Instead it was with our CAMHS therapist, who we've not seen in a while (she'd signed us off! ), and Dave-the-therapist, who does our theraplay. I don't want to go too much into the details of the review, but basically they feel that Mini has made great progress, as have we. They feel that another half a dozen sessions might even be enough to send us on our way, then we'd have a few more top-up sessions later in the year. They feel that we've got the tools now, and we just need to continue using them. Now, whilst I'm really happy they think we've made progress, and I know we have - I can see it; I'm surprised they think we've made enough. I'm nervous, and I just hope that even once we've finished our theraplay sessions, we'll still have access to appropriate support. So now the CAMHS therapist is coming back on the scene and it appears she will start re-visiting us again, presumably to ensure we're supported through the final leg of theraplay. So that was that one. We've also had a hospital visit to discuss Mini's continuing seizures. Mini's had another couple of seizures in the last few months, and so we had to remake the appointment we'd cancelled (which we'd done on their advice, because he went 6 months without a fit). Our appointments are with a paediatric neurologist, and she's never seemed particularly worried by the seizures. After the first EEG showed nothing, she's now suggesting a sleep-deprived EEG. She mentioned medication, but also suggested that most of the medications she would normally recommend can adversely affect behaviour. To be honest, whilst he has occasional seizures, and they're scary for us to see, I'm not keen to medicate unless they can give us a diagnosis or reason why they're occurring. I did ask her about any links between children who have suffered trauma and epilepsy/seizures/blanking (which all seem to be considered together), but my question was pretty much dismissed - she had no idea if there was a link, and didn't offer to research it or look for other research. We were told that children with behavioural issues are more prone to seizures/epilepsy than other children. I feel that the neurologist has become quite fixated on Mini's behaviour, and isn't seeing it as an expression of feelings and anxiety, but simply as poor behaviour. We'll have the next EEG and see her again in a few months. Finally we had the big one...the school meeting. Before the end of term I wrote a letter to Mini's teacher. It was quite strong, but after a whole half term of waiting for an appropriate IEP, and an IEP review that didn't actually review anything, I was pretty pissed off and frustrated. So my letter asked her to clarify how she saw the IEP working...was it for Mini, or the staff working with him. If Mini, had any of it been shared with him? If the adults, then why was it written in language appropriate for a 6 year old? I also asked for more detail, more information about how the targets and progress would be measured. I reminded them that an IEP should be written using SMART principles - Specific, Measurable, Achievable, Relevant and Time-Related. I asked for a meeting with her to discuss further and suggested a day. On the last day of term, we get home from school to see a note in Mini's home-school book about a meeting that has been set up on the day I suggested. Except it's not just with the class teacher, it's with the SENCO (last year's class teacher) and the head teacher (new in post, never met before). All holiday I've been thinking about it, worrying about it, wondering why they're bringing in 'the heavies', when all I wanted was another session with the class teacher. So, back to the meeting. We went in, sitting on soft, low chairs in a corner, whilst 3 women sat on higher chairs, towering above us. Already feeling intimidated, this seating arrangement put me further on edge. The Head started the session by asking me my concerns. I shared that I was worried that after half a term we still didn't have a second IEP in place. I was met with aggression and a barked 'yes we have, we're working to it at the moment'. I replied that I hadn't signed it, and as far as I was concerned, appropriate targets were still being considered and discussed. Both the teacher and SENCO agreed with me. It kind of carried on like that with every one of my concerns being met with either a 'yes, we're doing that' or a 'sorry, that's not always possible'. I felt like the Head was going to attack me or defend her teachers, with no middle ground or room for discussion. And it was made clear that because 'emotional targets are soft, they aren't measurable'. Yes, her words, not mine. There were no reasons given for the lack of preparation time and notice on two important occasions before Easter (a police visit, and a church visit). Nor any apology for me having to find out about the Easter church service from another mum, the day before it happened. I got an excuse from the teacher about being forgetful. Well, I'm sorry, forgetful doesn't cut it. What if I 'forgot' to take Mini to school? Or 'forgot' to ring in when he was sick? All in all, I don't feel much was achieved by this meeting. My previous frostiness towards the SENCO has thawed a little as she played a peacekeeping role between the Head and myself, and made thoughtful suggestions. The teacher cowered and looked at times- like she was going to cry. (Admittedly, all my issues were with her lack of forethought, warning and care in writing the IEP). Whilst I did get lots of praise for Mini and his growing confidence and academic skills, it felt very much like because they couldn't see the damage in Mini, or the anxieties that school seems to cause him, the Headteacher wasn't prepared to believe it or offer any support to help prevent it. So, I'm becoming fast disillusioned with this school, and this new Head who seems more focused on improving attendance and meeting targets, than the emotional well being of her pupils. And we still have another year and a bit to go with her for Mini, and Dollop should be starting at the nursery in September. I'm waiting to hear if Dollop got into this nursery, or whether the Head will have black-marked her because I'm a troublemaker?! I'm now considering whether to look for somewhere else to send Dollop for nursery, although I do think despite the difficulties we've had with Mini's schooling there, Dollop could settle well, and of course doesn't have the same needs as Mini. So that's our week, and now, we're waiting for Nanny and Grandad to arrive for the weekend, whilst also preparing Mini and Dollop for the NC being away for work again next week. Oh, and Mini and I have our first session of theraplay without the NC next week too. All go here! I am exhausted, 2/3 of these meetings have felt like a fight, or hitting a brick wall. It's ok. We've been going since February and are carrying on. I guess it's doing some good as the SWs and therapist are really happy with progress and Missy certainly seems a little calmer of late - no major earth-shattering tantrums and hiding herself in a corner and been a little less controlling. Like you, I like that its about 'us' and we can do a lot of the same activities at home. Sounds like a fun week! I cannot believe they have used 'being forgetful' as an excuse! We just had camhs and a neuro appointment next week so are following in your footsteps! Good luck with the neuro appt, let me know how you get on. With Dollop we had to apply directly to the school as it's nursery not a school placement, so am thinking the head will have some say...hope not though! As an ex-teacher I'd love to be able to say something helpful and encouraging about your experiences with Mini's school, but I can't! I taught at secondary school and the IEPs would come through like confetti at the start of each new year. Taking pupils in groups of 30 for one hour per week, it was hard enough learning all their names, never mind actually meeting their individual needs effectively. This is one reason why I'm no longer in teaching and why, when the time comes, I'll probably home educate OB. I also think there is a culture in some schools and among some teachers of seeing the parents as the enemy, or at least as annoying interferers. But you are right to fight for Mini's needs to be met - even if it never fully happens (and I fear that meeting the needs of individual children is a big ask in a mass education system like ours) at least you will make some progress and go some way towards getting what he needs. The key is to find someone at the school who will be yours and Mini's 'champion' - maybe the SENCO is coming round to your way of thinking? That would be a bonus! I feel my blood boiling for you,argghh. First of all that seating arrangement, so not necessary how can that be considered an acceptable meeting arrangement. I can hardly believe the excuse of forgetfulness for such important issues. And the aggressive behaviour, why can't people see that it's the well being of your child that concerns you, it's not personal. It is awful sending your child to school each day knowing that they may find it hard to deal with but even worse if you're not sure they will then receive the right support. Maybe the meeting will bring the teacher to reflect more on Mini's needs. I hope so. Remember you are doing an amazing job. Oh Stix, I wrote exactly the same post (Mumdrah Style). I have so much to say here, but I;'ll just tell you 'I know' (with a knowing wink) and let you know i was shouting at my laptop screen all the way through reading, and the main word was a loud resounding and angry F***. It is common for epilepsy and behaviour problems to go together - some seizures can manifest themselves as poor behaviour. I hope you can get to the bottom of this. Sometimes the constant appointments and meetings feel like they could do you in don't they? Then there's just regular appointments like dentists, doctors, etc. on top...for everybody! Oh and real life keeps happening too! I hope things settle down a bit for you soon and you get some answers from the doctors and some better communication and respect from the school. There are no words. What a week! Highs and lows and lots of major frustration. I've also worked in schools and was the champion for many teens and was often pushing for IEPs. In secondary schools it is a minor miracle if any changes can be sustained because the teachers are just too busy. I hope the SENCO will come on board, after all it is her bloody job to look after the pupils with special educational needs - she should read the title of her job post! Is a school change an option if necessary? There are links with epileptic style issues with attachment and trauma. PAC in London are working actively with this, although it seemed more related to blanks but it is linked to sensory overload. I'll dig out my workshop papers and message you.